Las Mañas is one of my favorite spots in the whole city, and nothing I can express here will do the ambiance and feeling this place gives off justice. The restaurant has been operating in Antwerp for 44 years and has a legacy of traditional Spanish cuisine that will leave you satisfied and blissfully entertained as well. Here you will find the best tapas in town by far! But of course you don’t have to take my word for it. The looks of the food is very Instagram-worthy but you will want to forget about your phone and dedicate your senses to the experience. The tapas menus will satisfy meat as well as fish lovers with generous portions – a fest of delicious food that will titilate your senses. And I mean all your senses, because this kind of food will pull your fingers in and you will gladly surrender. The place is decorated very warmly, making you feel welcome as soon as you enter through the door. 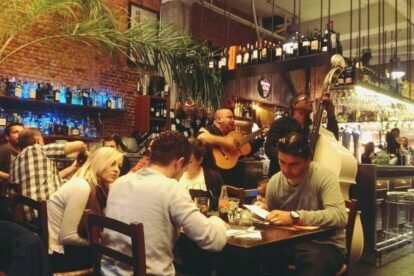 There’s nothing like the atmosphere created when the musicians step into this Spanish scene. You just hope that they won’t make their entrance along with your food, because you’ll want to get up and dance along – speaking from personal experience. This is a great place to celebrate with your friends and I guarantee you, you will leave Las Mañas with your happiness-level doubled (at least). Make sure to make reservations, especially on weekends to ensure your ticket to this fantastic restaurant performance.